Goldstar Sogi striker, Tominiko Tokuma has played 10 matches for his village side this season and netted a total of 16 goals. A quiet achiever, the 22 year old has slipped in under the radar. Consistently adding to his tally throughout the season. With three hat tricks to his name, Tokuma is also the leading hat trick scorer in the FSPL. 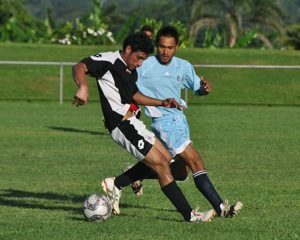 Tokuma first started playing football at 12 years of age for Faleata District and later gained a place with Goldstar Sogi FC playing fullback. “I know football is my talent and I am determined to give my best to lift my game to another level,” said the quiet spoken Tokomua. Meanwhile, the battle for second and third place is heating up. Moaula United FC brothers To’o (Fereti) and Luki Gosche are tied at 13 goals each. While Kiwi SC brothers Harry and Mason Hoeflick are locked at 12 goals each with Moaula United’s Bert (Bird) Keli. 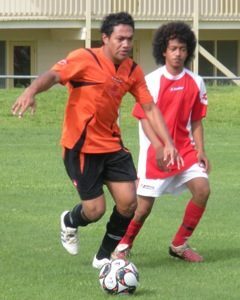 For match results for the current Men’s Football Samoa Premier League, click here.